Outside the Great Dome of Vicino Prossimo, no one understood the mysteries behind the smooth operation of the Vicinese Confederacy. Waves of benign direction emanated from the Dome into the High Council, and from the Council into the Universal Parliament. Waves of assent or dissent reverberated back through the Council into the Dome. The city itself was an enormous executive mechanism, humming with think-tanks, special committees, and the innumerable departments of its 83 universities. The capital was hard-wired into the planet, with its 46 major cities and its 25 trillion inhabitants. From there, the benign policies of the Dome emanated into the enormous galaxy of Vicino Lontano, which was 870 kiloparsecs wide. By comparison, the Milky Way is 30 kiloparsecs wide. The closer the Vicinese got to the capital, the closer they seemed to get to truth. The further they went from the capital, the more truth seemed like a nebulous thing. In the nectar bars and ganga cafés of Vicino Prossimo the students were always on the edge of some great discovery. They spent their time guessing at the murky politics of the Universal Parliament, the insight of the High Council, and the end-game of the mystic figures in the Dome, the Anunnaki. It was considered rude, even naïve, to question openly, as if you weren’t smart enough to figure it out for yourself. As if you didn’t already know. In their grad seminars they talked in circles, using vague language that they hoped would convey depth and knew would effectively obscure their confusion. The professors weren’t much help, either, since they always seemed to be hiding something behind the things they said. And because the Annunaki never showed its face, the power of truth seemed to multiply the more it was implicated in mystery. In the universes further away — the Panophilia, The Blue Dream, and the Pink Sea — the rumours splintered and were refracted by the lenses of the inhabitants. To the Panophilese, the Star was everywhere. Scientists might try to locate it and explain it, yet the most respected caste, the Mystics, refused to even speculate. In The Blue Dream many saw the Star as a metaphor. It was a possibility, an ideal that could inspire citizens to (as Dreamers put it) reach for the stars. In the Pink Sea the practical inhabitants went about their research with logic and precision. If it did exist, they would find out what it was made of, and what it required of the citizenry. If it didn’t exist, they would require a clear rationale for why it ought to. In general, from what astronomers gathered, no one knew if the Soul Star existed or not. All they had were some ancient accounts, some speculations, and some astronomical data leading inconclusively to a possibility. The wizard nerds of Scientium Fluvius (from a floating planet-island in The Pink Sea) claimed to have traced individual energy trajectories that occurred after the death of any type of living being. According to their studies (which have been meticulously monitored by the Intergalactic Science Council), after the body died it emitted an energy signal that was generally wave-like, yet also exhibited characteristics of magnetism, light, and dark matter. Sometimes this signal quickly became imperceptible, slipping away in nanoseconds like a dark grey shadow off their spectrometers. At other times it appeared as a distorted frequency for several seconds before it slid away from any known spectra. So far, the astronomers have been unable to track this signal for more than three seconds. They speculate that perhaps it slips into an alternate dimension, or perhaps it implodes into infinitely small fractals that are floating somewhere in space. The astronomers of Scientium Fluvius claim that these trajectories often take the form of extremely faint lines of dark purple light. Most of the time this light bounces and zigzags without any discernible pattern. The mystic philosophers of Teravidium claim that these trajectories aren’t random, but correspond to otherworldly topographies through which the soul-beam is travelling en route to its spiritual home. The Fluvians frown at this interpretation, since there’s no consistent pattern to these afterlife peregrinations. Some even note, drily, that if souls are in fact on some sort of afterlife pilgrimage, the pilgrims don’t seem to know where the shrine is. Other wizards consider this sarcastic note inappropriate, especially since in 7% of the afterlife energy signals clearly move in the direction of the Local Void, which is about 200 million light years wide, and can be found in The Violet Hoop. Prolixitar, a High Mathematician of Infinitar Prossima (a university planet in the universe of The Crimson Stalk) was an advocate of regional problem solving. 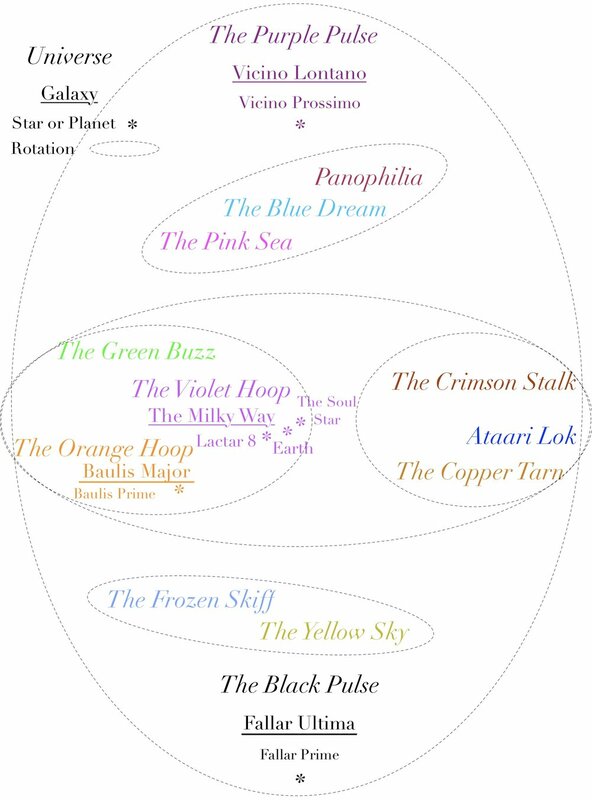 He argued that in order to understand the Soul Star one needed to understand the logic of the universe in which it was located, The Violet Hoop. He was fond of citing the mathematician and philosopher Blaise Pascal, who in addition to deriving calculus philosophized on the relation of the abyss to the soul. Pascal argued that the only thing capable of filling the infinite abyss of our erratic and meaningless lives was the meaningful infinity of an immutable God: ce gouffre infini ne peut être rempli que par un objet infini et immuable, c’est-à-dire que par Dieu même. Reductivas, a staunch opponent of anything Prolixitar wrote, wondered how it made sense to use a philosopher from a backward universe to explain the Soul Star, which clearly came from a Higher realm, and was just using The Violet Hoop as a place to hide. The inhabitants of The Violet Hoop were so backward that they couldn’t even detect the basic frequency of the advanced universes, the micro-nanometre. Alien species were zooming in and out of their galaxies all the time, right under their noses. How could the inhabitants of a universe like that even begin to understand the Soul Star? Reductivas also got down to specifics. While he could appreciate Pascal’s logic up to a point (perhaps Pascal was in fact a plant from Ataari Lok?) he objected that for Pascal’s scenario to work, the soul of humans had to be infinitely deep. Otherwise how could the container hold the contents? How could a limited soul, however empty, know an Infinite God? Reductivas then submitted 14 thousand pieces of evidence demonstrating that the vaunted profundities of the human soul were only convincing to humans. The mathematician cross-referenced the human claims about their eternal souls with human actions, at which point the Allied Council of Intergalactic Deductionists (ACID) saw what base nonsense the humans were puffing up with bursts of hot air. Prolixitar came to a different conclusion, however, about the possibility of an Infinitari High Mathematician sounding these depths. According to the astronomers of The Metaphorical Cone (a galaxy in the universe of Ataari Lok), the best metaphor for the Soul Star was a diamond — which in their galaxy shared the same properties as it did in ours, except that in the gravitational fields of The Central Cone the crystals continually shifted according to the declinations of their suns and galaxies and according to the densities of their dark matter moons. The Coneheads suggested that the Soul Star was like a diamond, compressed, orderly, and beautiful. It shined in infinite ways, depending on the way one saw it — and, on Metaphora Prime, according to the positions of the crystals on the dark sides of its seven dark moons. Up from Earth's Centre through the Seventh Gate / I rose, and on the Throne of Saturn sate, / And many Knots unravel'd by the Road; / But not the Knot of Human Death and Fate. There was a Door to which I found no Key: / There was a Veil past which I could not see: / Some little Talk awhile of ME and THEE / There seem'd - and then no more of THEE and ME. Hubble’s Barred and Booming Spiral Galaxy. 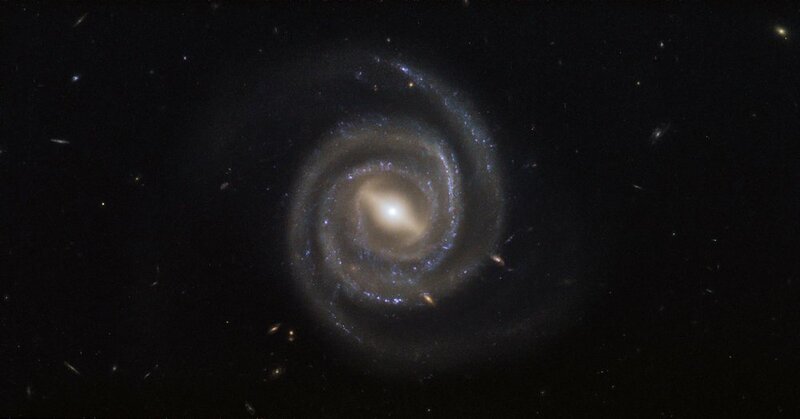 UGC 6093 is something known as a barred spiral galaxy — it has beautiful arms that swirl outwards from a bar slicing through the galaxy’s center. From NASA Hubble images at https://www.nasa.gov/mission_pages/hubble/multimedia/index.html. The theologians of Ruumar and Arabissimi (both solar systems in The Panophilia universe) were a more optimistic group. They quietly meditated on the possibility that the Soul Star was literally a compressed diamond, fractalled with all the things, spaces, angles, and spiritual entities in the cosmos. Dancing in swirling patterns to mimic the glistening stars, they chanted that within the Soul Star lay all the experiences that every species from every galaxy that had ever existed. It was literally an expensive, gorgeous, exciting, luxuriant diamond, compressed with Infinity itself. But the Star was in fact not a star. The first beings to organize space and give it meaning were the early Vicinese. After two billion years of intense research, they perfected the design of the infinite self-regenerating algorithmic fractal. One billion years ago they created the Soul Star. Although their creation isn’t technically a star, they took the star as their guiding metaphor. A great star gives light to the universe. It creates life with its soft, powerful energy. When it dies, it implodes and takes back the energy it once gave. The Soul Star gives life meaning because it confounds Death, once the great leveller of all things, rendering absurd all our attempts to understand and to exist. Like a black hole, the Soul Star takes back the energy of life. Like an active sun, it gives life back again. The beat of its pulse is life. The space between beats is death. The Soul Star is a tiny point of interstellar dust located in the near total darkness of the Local Void. In its infinite depths, the Soul Star contains the beauties of every single world in the thirteen known universes.